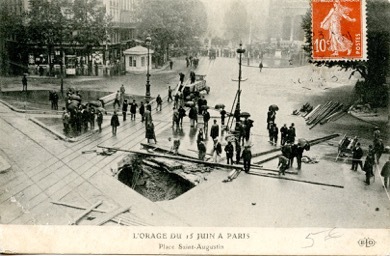 A few years ago, we found this postcard in a street market, showing a sinkhole in the Place Saint-Augustin. Of course, this wasn’t the first time the earth had opened up. Sinkholes are bound to happen in a city built on a hollow foundation. When you look at some of the beautiful stone buildings of Paris, much of what you are seeing was once beneath the city. Since Roman times, underground quarries below the city have yielded limestone and gypsum. Paris, especially its southern and northern extents, is built upon the empty spaces left by the seemingly insatiable desire to bring the underground above ground. Underground quarrying was a long tradition. There was no overall supervision, but skilled quarrymen (usually) knew when to stop. They read the clues in the groans emanating from the rocks, in the appearance of ceiling cracks or rockfalls. The caverns they left behind were littered with debris and punctuated by columns of undisturbed rock to bear the weight of the city above. Over time, more and more massive piles of stone–churches, palaces, shops, and houses–were built over quarries in areas that had once been outside the city. Above ground, buildings were inspected carefully, while below ground, nobody thought to take a look. But life can change in the blink of an eye. December 17, 1774. One of the main routes into the city from the south brought merchants and tradespeople through the “Barrière d’Enfer.” Enfer means hell. There are various theories as to how the street got its name, not all of which deal with hell. But that day, the street seemed well named. One of the King’s architects, Antoine Dupont, was appointed to inspect the damage and carry out immediate remedial underground work in the rue d’Enfer. But a longer-term and wider-reaching solution was needed. 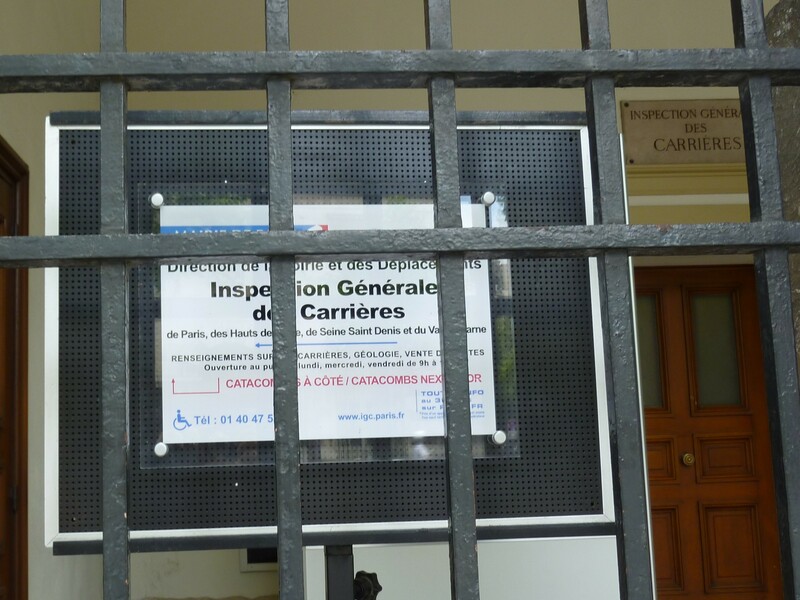 The French might not have invented bureaucratic inertia, but they had a certain track record. 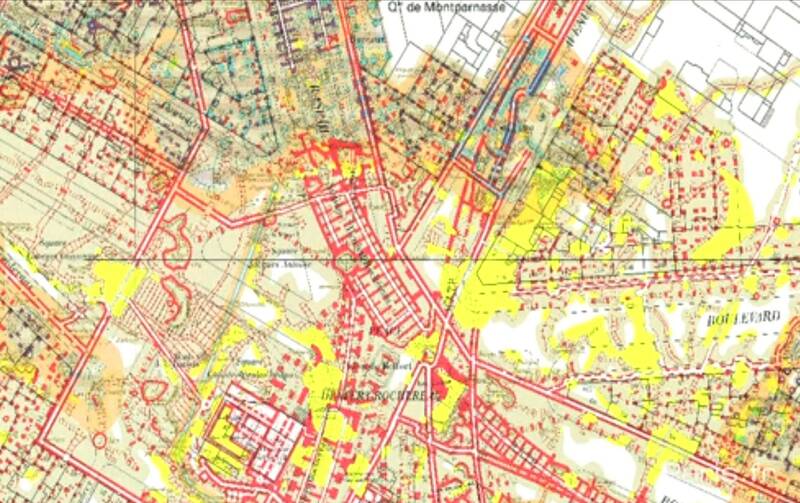 More than two years later, on April 4, 1777, Louis XIV created the Inspectorate General Service of Quarries, to inventory, map, and consolidate the cavities under public property and maintain a watch for further changes. Further paperwork was, of course, required. Finally, on April 24, 1777, the first Inspector of Quarries assumed his duties. Charles-Axel Guillaumot was a brilliant architect, winner of the Prix de Rome at age 20, but he had not been born in France, and was denied the scholarships that would have given him both training and connections. Still, he worked hard and developed a reputation for fixing up other architects’ failures. He also had the sense to marry the daughter of the chief architect of Paris, but the big commissions had eluded him until now. 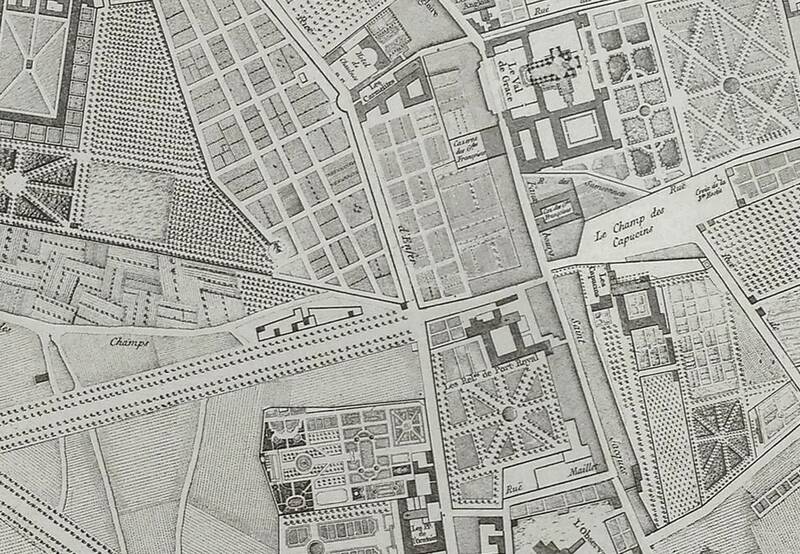 On the very day Guillaumot took office, another collapse occurred near the convent of the Feuillants des Anges Gardiens, closer to the centre of the city. Guillaumot was on his way to the site of the first collapse in a sedan chair, but the way was blocked by traffic and officials. His royal warrant let him through to the site of a twenty-foot-diameter sinkhole. Clearly, the job was going to be larger than anyone had foreseen. Guillaumot’s job was to save Paris from collapsing in on itself. He embarked on this work with an architectural and design sensitivity that most would have thought only the aboveground world deserved. In essence, he created a mirror city underground, with streets and squares, walls and columns, but no dwellings. Today, Guillaumot’s one visible achievement is the Catacombs. This was created when the ninth-century – and continuously used – Cimetière des Saints Innocents became too full and a retaining wall collapsed in 1780. 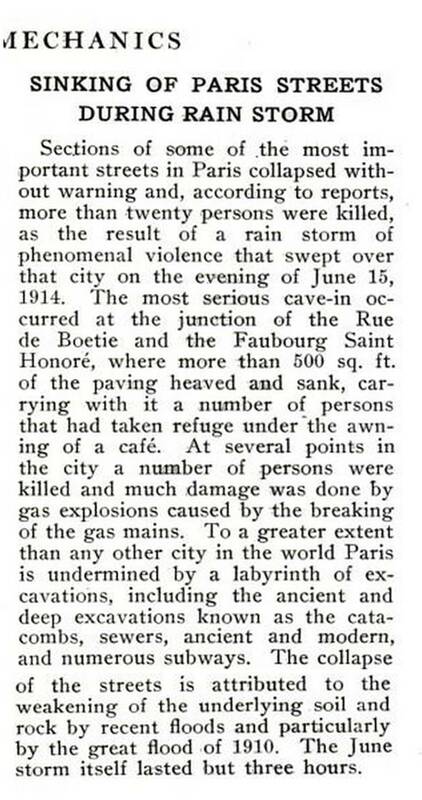 Like the cave-in of 1914, it occurred following a long spell of rainfall. The results were neither pretty nor sweet-scented. Guillaumot came up with a solution. He had an ossuary installed in his underground city and arranged to move the dead there. 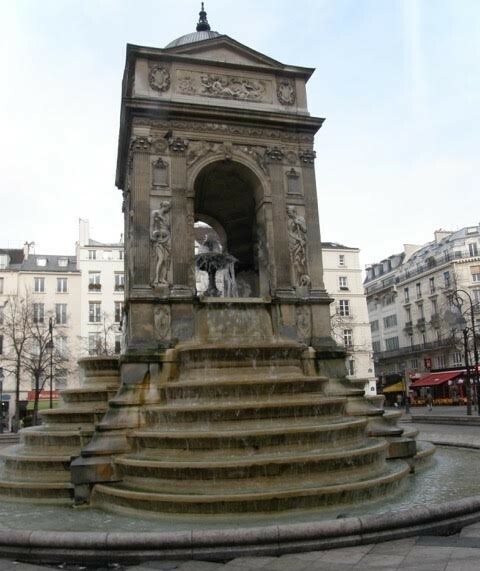 Work started in 1786 and continued for a year as the remains of Paris’s dead were exhumed and relocated. Rather than simply piling the untold number of bones in an untidy heap, Guillaumot devised a huge sculptural assemblage of human bones organized by type. Guillaumot’s career was interrupted by the Revolution. He was imprisoned: he had been, after all, a royal appointee. Unlike many, however, he was eventually freed and in 1794 resumed his work as Inspector of Quarries and continued until his death at the age of 77. There is a curious footnote to his life. Guillaumot was buried in the Cimetière Sainte-Catherine after his death in 1807. But the city grew, cemeteries filled, and eventually the bodies were relocated. The Cimetière Sainte-Catherine was excavated in 1883. Guillaumot’s gravestone disappeared and his remains were conveyed to the ossuary he himself had envisioned and built. His now-anonymous skeleton joined the three-dimensional sculpture of human remains that was part of his legacy. The city he built underneath Paris has been used for everything from growing mushrooms to (more recently) all-night raves. Victor Hugo made good use of this city in his novels. Brown is for quarries; yellow is for gypsum (which is soluble and has a nasty tendency to dissolve in periods of heavy rain). Purple is for areas of erosion and ancient sand or clay pits. 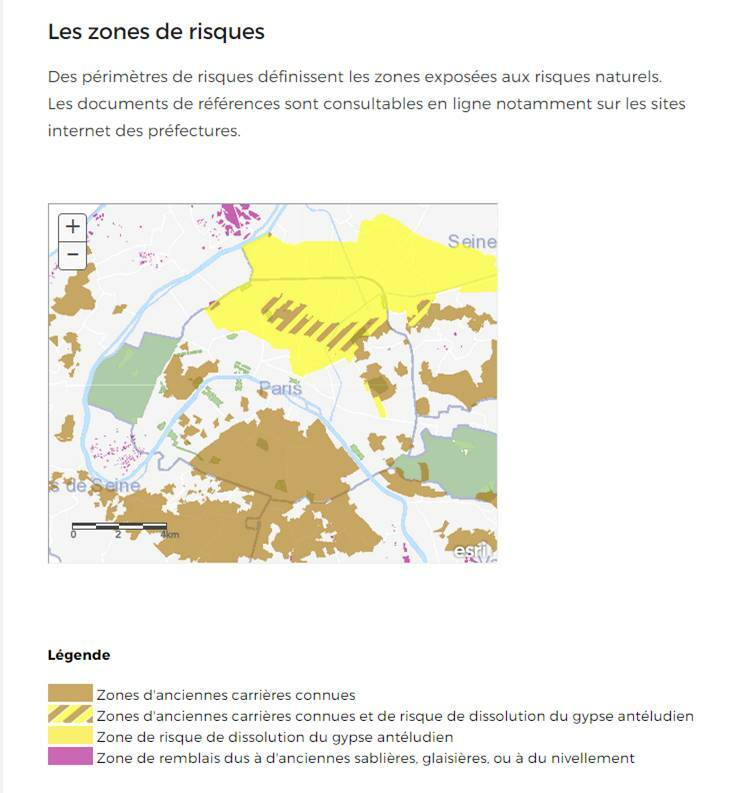 Whenever property changes hands in Paris in any area known to have ancient quarries, the seller must provide assurances that the structure is secure. 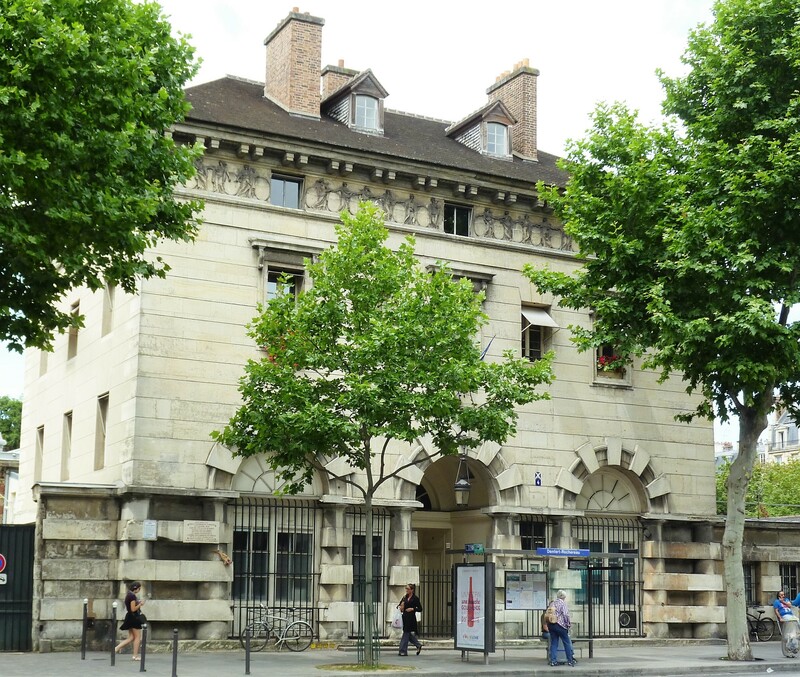 And the current office of the Inspector is, appropriately enough, located close to where it all began at the Mouth of Hell: on the rue Denfert-Rochereau, in the customs house built by Ledoux in the 1780s. Text and photographs by Norman Ball and Philippa Campsie. The full story of Guillaumot is told by Graham Robb in Parisians: An Adventure History of Paris, Picador, 2010. This entry was posted in Paris cemeteries, Paris civic functions, Paris history, Paris maps, Paris streets and tagged Antoine Dupont, Barrière d’Enfer, Catacombs, Charles-Axel Guillaumot, Cimetière des Saints Innocents, Cimetière Sainte-Catherine, Claude-Nicolas Ledoux, Feuillants des Anges Gardiens, Graham Robb, Gypsum, Inspectorate General Service of Quarries, Limestone, Louis XIV, Mouth of Hell, Place Saint-Augustin, Plan de Jaillot, Quarries, Rue d’Enfer, rue Denfert-Rochereau, Storm of 15 June 1914, underground Paris. Bookmark the permalink. Thank you for such an interesting piece, especially the maps. Thank you for this fascinating post. I knew the generalities of this story, but not much of the detail.